After our summer vacation in Germany, my husband got a big craving for a nice Indian curry. We have an excellent Indian restaurant in Dubai where we always eat when Indian food cravings come up. However, I suggested to invite some friends over to our house and have some home-cooked curries instead (the dessert will be German Apple Strudel with vanilla ice cream, but that's another story/blog post). Whenever we eat at that Indian restaurant, I like to order Mutter Paneer, a vegetarian curry with green peas (Mutter) and cottage cheese (Paneer). I'd like to do this dish when our friends come over on the weekend and I tried to make the cottage cheese today. It's another one of those recipes where I am just so surprised how easy it is to make at home. Bring the milk to the boil and take of the heat immediately. Add the lemon juice, one teaspoon at a time and keep stirring the milk after each addition, until the milk separates; the solid curds will separate from the green watery whey. Allow the curds and whey to cool for a half hour (or until still warm, but at a temperature you can handle), then strain through cheese cloth (a cotton kitchen towel or muslin will do) in a strainer. Save some or all of the whey; it can be used to make your next batch of Paneer, producing a slightly more tender cheese than lemon juice. 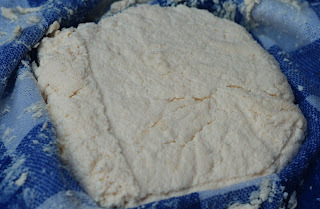 The whey can also be used to keep the Paneer in in the fridge for a few days. Wrap the cheese cloth on itself in order to squeeze out moisture from the curds. The more you squeeze, the firmer the resulting Paneer. Shape the Paneer, still in the cheese cloth, into a block, wrapping it tightly with the cloth. By putting a cutting board or something heavy and flat on top of the Paneer, you can force out more moisture, and make it into a firmer block, suitable for slicing and frying. The longer you press the cheese, the firmer it gets. Soak the block of cheese in chilled water or its whey for 2-3 hours. This is optional, as the intention is to improve appearance and texture.